Imagine an unspoiled rain forest bordering a beach with clear clean water. Imagine waking up to the sound of the waves and the birds. Now add campfire, yummie food, crazy buildings and comfortable accommodation, plus a great team to take care of you during your stay. That is Banda Island! Ten hectare of the island were leased in late 1990’s by Dominic Symes (aka King Dom of Banda) and it opened as a resort in 1999. 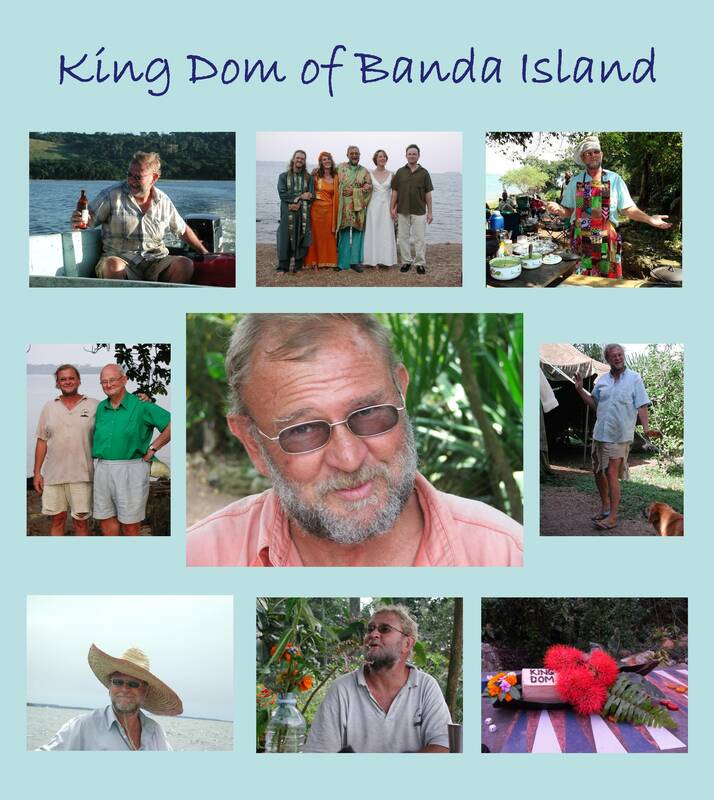 Dominic died in May 2011 and ever since his friends are keeping Banda island alive in his memory. Banda is a typical place to relax. So bring a book and chill. 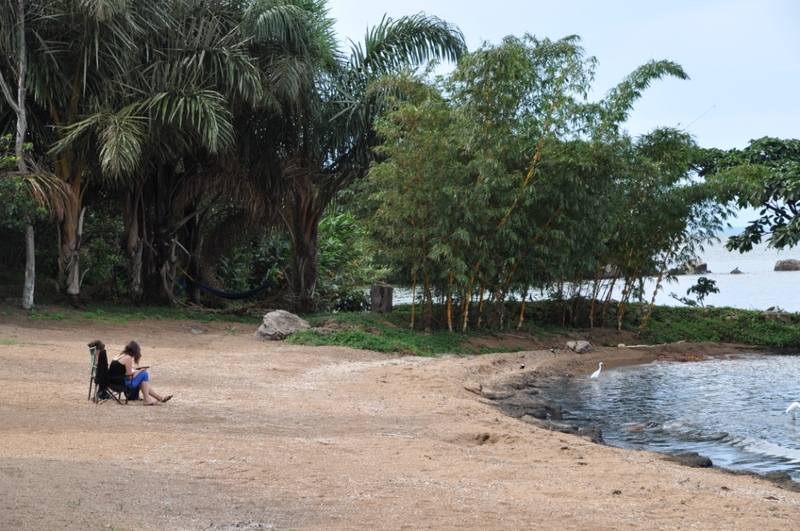 There is quite an interesting bird life to watch from your chair or hammock along the shore, and there is also the occasional family of otters passing by. Your own beach – with a view! The most popular past time for customers seems to be stretching out after a large meal, or soaking up some skin cancer on the sandy palm fringed beaches. However, the swimming is superbly relaxing and there is nothing nasty in the water (do check out the page on Schistosomiasis/Bilharzia!). We have two beautiful Back Gammon games built into our dining table. Worth trying! Also on the beach you find a net and a volleyball waiting for you to sweat out the huge lunch before you settle for a shandy on the beach. 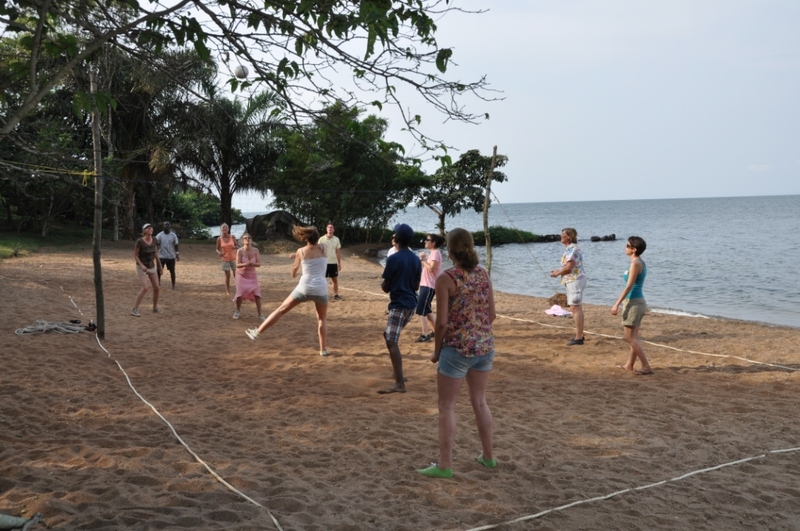 We also have Jenga, Petanque, Darts and various other games for you. No boredom on Banda. Another popular past time is jetty fishing or swimming to the tiny outcrop in front of the beach and enjoy a great sunset from there as well. We also offer trolling with Kato with a good chance to catch Nile Perch. If you are an avid sailor you can take our Laser our for a spin. Is this all too much ‘water’ for you take a walk to the lookout hill through the rain forest where you have a splendid view of the Ssese islands or continue and visit the fishing village on the other side of the island. You can find more pictures in the Images of Banda Page. Check out our rates page for the available accommodation options. All rates include all meals plus tea and coffee all day. We hope to welcome you on Banda Island! Check out the reviews of previous visitors! Banda Island is proud to support the Nile River Festival, Africa’s largest and longest running whitewater festival.